Avocado Sauce for the win! Whatever else is in this recipe doesn’t matter besides the sauce that is on top. The sauce is key and its amazing and I even used as a salad dressing later. Click here for it. For this particular meal, I cut up a small piece of steak and sauteed it on a frying pan with some spices and EVOO (super plain). I made 2 zucchini’s worth of spiralized noodles. When the meat was almost done I threw the noodles on the pan and heated them up just a bit (3 minutes-ish). Then I added one fresh cut up tomato and the sauce. – viola! The most important part of this post is the sauce. It is super easy to make. Feel free to add more or less or any spice and as much EVOO as you’d like (hint: the more you add the soupier it will be). I’ve made this sauce when I’ve been in a bind a few times and I change it up a little bit every time…maybe next time I’ll add a dash of hotsauce to kick up a knotch -who knows?! 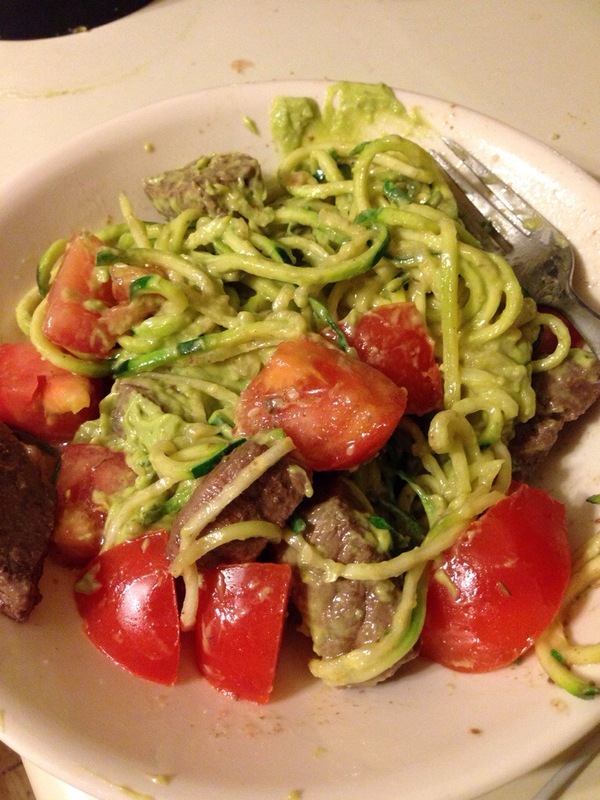 This entry was posted in Dinner, Lunch and tagged avocado, noodles, paleo, paleology, sauce, spiralizer, steak, tomatoes, zucchini. Bookmark the permalink.